lower left: GEO. A. HAYES. Recorded as from New York. (Henry W. Cowan, Troy, New York), by whom sold in 1953 to Edgar William and Bernice Chrysler Garbisch; by bequest to NGA, 1980. American Primitive Paintings from the Collection of Edgar William and Bernice Chrysler Garbisch, Part 1, National Gallery of Art, Washington, 1954, no. 108. American Primitive Paintings, National Gallery of Art, Washington, D.C., 1955. Sport in Art, traveling exhibition circulated by the American Federation of Arts, 1955-1956, no. 47. American Folk Art. Part of American Art. Four Exhibitions, Brussels Universal and International Exhibition, Belgium, 1958, no. 97, 49. 101 Masterpieces of American Primitive Painting from the Collection of E.W. and B.C. Garbisch, traveling exh. by the Amer. Federation of Arts, New York, 1961-1964, no. 91, color repro. First venue: The Metropolitan Museum of Art, N.Y.
Fifty Masterpieces of American Painting from the Collection of Edgar William and Bernice Chrysler Garbisch, Society of the Four Arts, Palm Beach, Florida, 1967, no cat. American Naive Painting of the 18th and 19th Centuries: 111 Masterpieces from the Collection of E.W. and B.C. Garbisch, traveling exh. by Amer. Fed. of Arts, N.Y., 1968-1970, no. 97, repro. First venue: Grand Palais, Paris. American Naive Painting of the 18th and 19th Centuries: Masterpieces from the Collection of E.W. and B.C. Garbisch, organized by the Amer. Fed. of Arts, N.Y., and Mainichi News., Nihobashi Mitsukoshi, Tokyo, 1970, no cat. The New World: 1620-1970, The Chrysler Art Museum, Provincetown, Massachusetts, 1970, no. 20. What is American in American Art, M. Knoedler and Co. [benefit exhibition for the Museum of American Folk Art], New York, 1971, no. 60, repro. 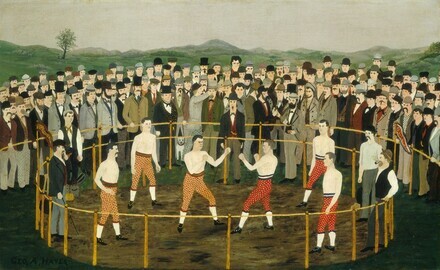 Champions of American Sport, National Portrait Gallery, Washington; Chicago Historical Society; American Museum of Natural History, New York, 1981-1982, not included in cat. American Naive Paintings from the Garbisch Collection at the National Gallery of Art, Taubman Museum of Art, Roanoke, Virginia, 2010, no cat. Black, Mary, and Jean Lipman. American Folk Painting. New York, 1966: 103. Bihalji-Merin, Oto. Naive Art: A History and Worldwide Survey. New York, 1971: color pl. 39. American Paintings: An Illustrated Catalogue. National Gallery of Art, Washington, 1992: 197, repro. Chotner, Deborah, with contributions by Julie Aronson, Sarah D. Cash, and Laurie Weitzenkorn. American Naive Paintings. The Collections of the National Gallery of Art Systematic Catalogue. Washington, D.C., 1992: 175-177, color repro. 176.